Konishi Hirosada (ca 1810 - 1864) Arashi Rikan II as Sasahara Hayato: Tales of Loyalty and Filial Devotion, 1848. Deluxe Chuban. This is an historically very interesting print. This deluxe piece, heavily layered with gold on the object in the actor’s hands, is a contemporary record of the Tenpo Reforms of the 1840’s. The reforms were introduced to Osaka in 1842 and banned the portrayal of actor prints. This resulted in an almost complete cessation of production until 1847, when Hirosada was the first artist to test the ban by producing an intermittent series that showed actors in famous historic roles but without their names. He at first signed these with the fictitious name Hirokuni, then sensing that there was no will to prosecute, he produced more un-named sheets signed with the name Hirosada - a reversal of his previous name Sadahiro which he had hitherto been using. 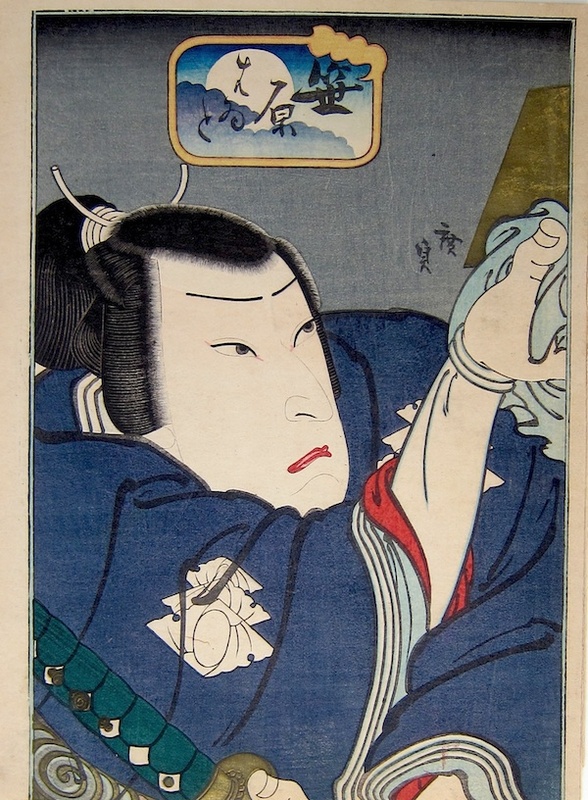 Arashi Rikan II also appears in the role of Sasahara Hayato from the play Ogura no Shikishi in the related print by Hirosada of the same subject, holding the same clothbound object. A very nice piece, beautifully drawn and embellished with gold metallics. Very fine colour and impression as usual with these limited edition pieces and in mint condition. Full size on three sides, trimmed to the image at the base.